How can you incorporate art into your kid’s daily rhythms? Kids are natural artists. You don’t have to teach kids to play or be creative. It comes naturally. Kids play and they learn through play. What they need is opportunity to explore different mediums and be given the permission to get a little messy. 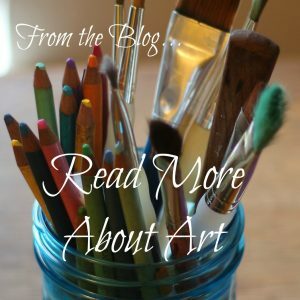 Kids learn so much through exploring art! They are learning through the input they are receiving through touching and manipulating materials. They are learning creative thinking skills and problem solving. They are learning a means of self-expression. They are even learn social skills and emotional skills by their sense of accomplishment and the joy in sharing their masterpieces to others. Process. Process. Process. I can’t emphasize this enough. Art making is about the process of art making. Not the final product. This goes for children and adults. To reap all the benefits art making can offer it is important to focus only on the process of the making. Do not have expectations about what the final product will look like or whether it is gallery worthy. Every once in awhile you may find that you created something that really pleases but the benefit is more in the journey through the project. Exploring the materials, how they feel, how they move, how they react with one another is. Trying out new techniques or mediums. Finding what you enjoy. Solving problems that arise. Creating alone or with others. This is the process. Creating art with kids or encouraging them to create and explore on their own is fun and easy! Start with quality materials. Prepare for mess. Offer materials a little at a time until they learn how to work with them. Encourage them to play and experiment. And hold your tongue. The hardest part for me was just letting go and watching what unfolds when my son works. I am often tempted to say, “try this” or “don’t do that” or “do it this way”. However I have really learned to bite my tongue and just let him be. My son now enjoys art so much and does not feel burdened with rules and limitations. And I love watching him! There are so many types of materials and techniques and projects to explore. There are pre-made kits ready for kids or you can just offer them some blank paper and some paint. I prefer to just offer blank paper and paint with sponges and brushes and let him explore.